Are you planning on moving to Kirkland or the Eastside? Contact Century21 Northwest today to help you find a home in the area. Founded in 1866 by Peter Kirk, Kirkland has a population of over 45,000 people. Kirkland's best- known feature is the downtown area reminiscent of European shops. The numerous lakefront shops, mostly restaurants and art galleries, share beautiful water frontage with several public parks, beaches and displays of sculptures and other art. Based on per capita income, one of the more reliable measures of affluence, Kirkland ranks 13th of 522 areas in the state of Washington to be ranked. Bordering Kirkland are the cities of Bellevue to the south and the infamous Redmond to the east. 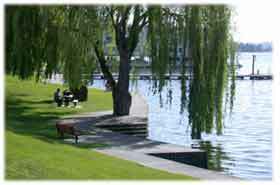 Kirkland is the only city in the region to have maintained 25% of its 4 miles of waterfront for public use. This accounts for the magnificent views which can be found from its parks and private residences. Marina Bay Park, the most notable landmark of Kirkland, draws visitors from neighboring cities during the summer, for exactly this reason. Kirkland is also very well known for its excellent schools. The Lake Washington School District is a very popular destination for parents who want their kids to obtain a solid public education. It encompasses 23 elementary schools, 7 junior high schools and 4 high schools, with about 24,000 students.